To appreciate the story of Fish Bonz, you’ll want to know more behind the story. As the owner of Fish Bonz Grill, my love for fish grew at an early age. I’m a native Southern Californian and third generation Japanese American, grew up in the South Bay and graduated from Gardena High in 1977. At a young age, my father taught me the many techniques of catching, filleting and preparation of fish. Growing up on the local fishing boats and taking many long-range trips out of San Diego over the last forty-five years, my passion for fish has grown, giving me the knowledge about all types of fish and their characteristics to prepare them. Participating in various business ventures, my other business is in the clothing industry as a sales manager for one of the biggest manufacturers of suits on the west coast. Not only do I manage a sales force, I also help in design, fabric selection and selling of all products. My career has enabled me to travel the world, meet many fascinating people of all nationalities and see the world through different eyes. With this experience and my vast knowledge of fish, it has been my dream to open a seafood restaurant that is affordable, without compromise to taste, or quality. I’ve learned over the years that the best tasting and healthiest way to prepare fish is to simply grill it fresh, which enhances its natural flavors. I got my friends together, told them the plan and put my fish to the ultimate test. My friends took one bite and said, “Wow! I didn’t know fish could taste this good.” They all loved it! The responses were “awesome, delicious and OMG…” to name a few. I replied, “It’s all about the taste! Make no bones about it.” Fish Bones was soon there after born, or as I like to spell it, with an added twist, Fish Bonz. Through trial and error, and with the help of friends, with the combination of the “grilled catch of the day” and my “secret garlic butter sauce recipe,” I knew I had to put this dream into action. It has been five years in the making and I have finally opened my own place and am thrilled to share my passion for fresh and healthy fish with you. I am committed to offering you the absolute best quality of food that not only tastes great and is a great value, but that is good for your health and wellness. 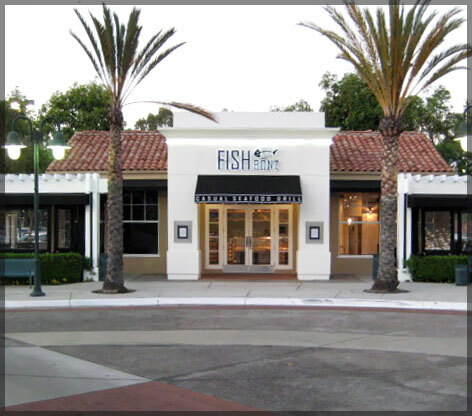 Fish Bonz offers a range of creative, fresh dishes with many varieties of fish and seafood– a great selection of tacos and wraps, teriyaki bowls, fresh tossed salads, sweet potato fries, grilled zucchini, white beans, and homemade coleslaw. With desserts and beverages and chowder too – there is something you’re sure to love. Try our favorites, unbelievable grilled salmon with succulent garlic butter sauce or our scrumptious Shrimp Tacos so fresh you would think you’re eating right from the docks – and remember all at affordable prices. To meet our high standards in freshness, we only use fresh ingredients brought in daily to insure impeccable quality and taste. Fish Bonz combines its design elements to create a very hip and industrial vibe. We use natural wood trim, brushed aluminum and stainless steel accents, a black and white palette with two spacious outdoor patios that can be enclosed and enjoyed year round. Clean lines, simple, sleek – we want our place to give you an experience that’s California casual, comfortable and relaxing so you’ll want to keep coming back for more. Fish Bonz menu was created for the health conscious individual who does not believe in compromising taste. That’s what we’re all about. We trust that you will feel and taste the difference. We understand that you are committed to living a healthy, well balanced, and active lifestyle. It is our promise to help you achieve that. We here at Fish Bonz Grill are passionate about food. We love what we do and we want to serve you a great meal soon! Whether it’s before or after a movie, on a break from work or shopping, to celebrate a special event, if you don’t feel like cooking, or if you’re craving a healthy delicious meal, come on by so we can make it fresh for you just the way you like it.